This program was open to Medical students studying in China, essentially to bring them closure to their own Community, sensitize them to healthcare needs of the community and be a part of Community drive movement. Also in this they will imbibe Leadership skills. There are inter semester vacations 0f 5 weeks duration, when students will be in India, a suitable time for short interactive, practical sessions on Medical/ Health related issues. This is the genesis of Community Health Program. Information was widely disseminated among the students and phone calls made to ensure their participation. Preparations were made concerning selection of the Village, local contacts, stationeries, banners, pamphlets, ID Cards and personnel. Dr. Amit Bose and Dr. Mohan participated in the program from SIEWF and 25 students from various Universities in China namely Hubei, Dali and Luzhou also took part. On day one students were informed about the program and detailed about their role. The village was divided into six zones and each zone was visited by a group of 3 students. The team will introduce themselves to the families, collect detailed information such as number of persons , age, births, deaths, illnesses, medical expenses, how they store water, their source of water and give information about waterborne diseases. The village Panchayat office was the meeting point in the morning and evening. The students were equally, enthusiastically attended the program, visited the families, collected the necessary details, distributed the pamphlets and gave information about waterborne diseases. The villagers in turn interacted asking for some solutions to Filariasis disease prevalent in them. During the five day period students also visited Primary Health Centre, Sangam Milk Dairy. This was a wonderful experience for them to know first hand activities concerning Public Health and Milk preservation, Milk hygiene. The program concluded on the fifth day with evaluation regarding how they felt about the entire event, contents, food, source of water, disease pattern and waterborne diseases. 25 students participated from various parts of Andhra Pradesh some as far as Nellore, Cuddapah, Nalgonda. The team work was satisfactory. The villagers were quite excited about future doctors talking to them and freely sharing information concerning their illnesses. In the present day context of high commercialization, digital divide, urbanized culture may be this exercise might have caused ruffles in the minds, hearts and stomachs of students, though remained hidden and may be SIEWF has to do some more home work in the next program. Here are some more details of the current program in Guntur. These health problems among the families visited so far. Filaria is a very important problem and people want some lasting solution. General pains, allergy, Eye infection, ankle pain, cough, diabetes, cold, headache, Fever, Injury, Gastritis, dog bite, abdominal pains, motions, dental pains, diarrhoea, weakness. 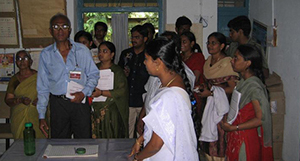 This Program was conducted for 5 days beginning Aug 16, 2008. Mr. Kilari Rajan Babu, Chairman, Sangam Dairy, Sangamjakarlamudi. Mrs. Chamundeshwari, Nurse, PHC, Sangamjakarlamudi.